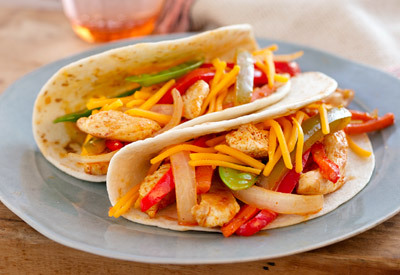 Chicken, veggies and a kick of chili powder combine in these simple-yet-spectacular fajitas. You know that recipe the whole family is excited to eat? Yeah, this is that one. Heat oil in large nonstick skillet on medium-high heat. Add chicken; cook and stir 5 minutes or until done, stirring occasionally. Stir in dressing, vegetables and chili powder; cook 5 minutes or until vegetables are crisp-tender, stirring occasionally. Spoon down centers of tortillas; top with cheese. Roll up. Serve topped with TACO BELL® HOME ORIGINALS® Thick 'N Chunky Salsa, BREAKSTONE's or KNUDSEN Sour Cream and shredded lettuce. Substitute frozen Asian mixed vegetables for the cut-up fresh vegetables. Refrigerate any leftover chicken mixture. Reheat in the microwave before topping with cheese and wrapping in tortillas as directed.